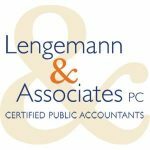 Lengemann & Associates, PC provides a wide range of professional services to both individuals and businesses in a variety of industries. They are composed of a team of 9 professionals that offer full-service accounting, auditing, tax support, business management & consulting services, small business software consulting, retirement & estate planning, as well as QuickBooks solutions and support. Work For Lengemann & Associates, PC? Claim This Page.